In the recent years, many brides are choosing two bridal dresses for the big day: one for the ceremony and another for the Singapore reception. The gown for the ceremony looks more formal and usually restricts movement, such as mermaid silhouettes and ballgowns. Brides who opt for these ceremony dresses prefer to change into a completely different dress for the reception, so they can dance and move around comfortably. A bridal studio offers a myriad of options to choose from. If you consider switching into a comfortable reception dress on your wedding day, make sure to keep these tips in mind. One great thing about having a second bridal wardrobe is that you can pick a shorter and more comfortable type of dress. Many boutiques have collections of short wedding dresses—some are more formal while others look casual. If you’re going for comfort in hot Singapore, a halter style with flowing skirt would be a perfect pick. For a more formal choice, you can go for a tube or sweetheart top with fuller skirt. If you wish to wear a floor-length dress for your reception, ask your bridal boutique for more forgiving silhouettes and dresses made of comfortable materials—think empire waist and sheath dresses. The one thing to keep in mind is that you don’t want your reception dress to outshine your ceremony gown. Beadings and laceworks are fine, but keep them less than your ceremony dress. Brides don’t always have to wear white. Choosing a coloured reception dress is a new trend that more and more Singapore brides are embracing. For instance, if your wedding colours are purple and pink, choose a cocktail dress in the shades of those colours or a beautiful red dress. An important point to remember, however, is to not choose a colour that matches your bridesmaids. You want to stand out at your reception, not to blend in with the crowd. Stay true to your style when choosing a ceremony dress and a reception dress. Your style will tie both looks together. For example, if you aim for a fairytale-like wedding, choose regal style dresses. There are many elegant wedding gowns from White Link bridal in Singapore that you can choose from. For the Singapore ceremony, wear a ballgown or a princess style wedding dress, with intricate beading and off-shoulder sleeves. 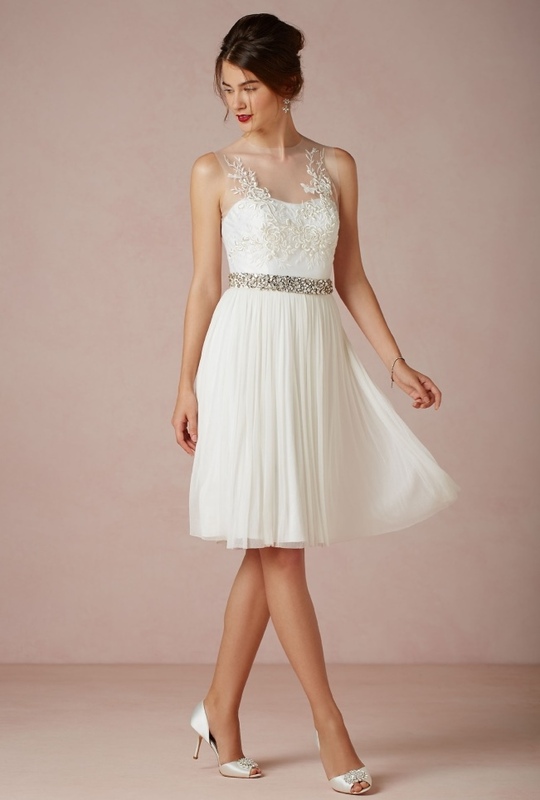 For your reception dress, pick a sweetheart, A-line, tea-length dress. When both of your dresses reflect your style, the outfit changes will flow seamlessly together. If you want a touch of your culture in your wedding, your reception dress can be a great way to represent it. For Singapore brides, you can wear a cheongsam. Choose the shorter style for a more comfortable choice. Another way is to accessorize accordingly if you don’t want to don a traditional dress. Instead of wearing a cheongsam, accessorizing in red and gold would be a tasteful option to keep your culture subtly included in your celebration. Some boutiques carry dresses that can be worn in different ways, so make sure to ask your bridal studio for this collection. Some full skirts can be removed to reveal a short dress underneath, long sleeves can be detached to reveal off-shoulder straps, or boleros can be removed to reveal sleeveless or tube top. By wearing a dress with these elements, the transition from ceremony to reception look is automatically cohesive since the body of the dress is retained. If your wedding gown displays opulence and elegance, carry this stunning look into your wedding reception by bringing the gorgeous elements from your ceremony gown to your reception dress. For example, if your first dress is adorned with heavy beadwork, ask your bridal boutique consultant for dress options in beaded sheath silhouette neckline or sash/belt that hints at the glamour of your wedding gown. First off, plan things ahead of time. Have the dress, shoes, and jewellery (yes, some brides switch all the accessories, too) all laid out in the master’s room of your reception venue. Designate one or two of your friends (but definitely not three or more) or your wedding planner to help you change. If you bring too many people in the changing area, it might take longer for you to change than necessary. Ideally, you can change right after the Singapore ceremony, before the reception starts. However, some brides choose to change after the first dance or before the party started. If you prefer changing while the reception is going on, make sure not to be gone for more than 10 minutes or your guests will notice you have been gone long enough. Your wedding planner should be able to keep you on schedule and urge you to get back to the party if you’ve been in the changing room for too long. Having two wedding gowns is a relatively novel trend, so don’t confine yourself to a certain fashion rule or expectation. Take advantage of this opportunity to spice things up in your wedding day, to be creative with your look and to surprise your guests, and most of all, your groom. But remember, it isn’t necessary to change into another dress. If you love your wedding gown and prefer not to take off the dress you painstakingly put on earlier, you can certainly wear it throughout the night.